The Hot spell as shown in forecast map (Friday Post Below) in effect on Sunday !! Kandla 44.6c, Jaisalmer 44.5c, Rajkot 43.6c, Barmer 43.4c, Bikaner 43.3c, Ahmadabad and Wardha 43.0c, Nagpur 42.8c and Bhopal 42.7c, Raipur 41.4c. Heat To Increase in Most of Sub Continent Regions from 18th through 21st April. Kolkata may see a rise in day temperatures on Saturday and Sunday to touch 39c/40c this weekend. Kolkata may see it rising to 41c early next week, peaking on Tuesday or Wednesday to touch 42c. Next bout of rain for Kolkata most likely on Thursday 23rd. Delhi NCR expected to touch 40/41c on Sunday and Monday. The upper air cyclonic circulation over Sub-Himalayan West Bengal and neighbourhood now lies over Assam & neighbourhood and extends up to 1.5 km asl. A cyclonic circulation extending upto 0.9 km a.s.l lies over Comorin area and neighbourhood. The trough of low at mean sea level over southwest Bay of Bengal persists. Sivagana, Theni, Kanyakumari and delta got heavy rains. After Vellore, Chennai, Madurai, Salem, its the turn of Trichy to get battering. 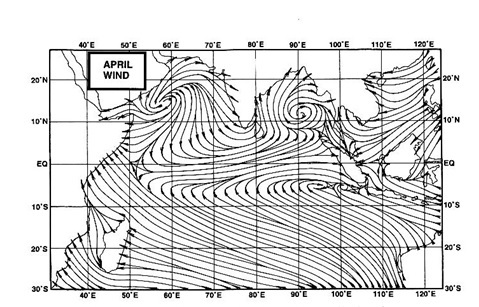 The trough of low at mean sea level over southwest Bay of Bengal persists.The cyclonic circulation over Lakshadweep area and neighbourhood has moved away westwards. The cyclonic circulation over Lakshadweep area and neighbourhood has moved away westwards. trough from central parts of Madhya Pradesh to Lakshadweep area now runs from southern parts of Uttar Pradesh to Comorin area extends between 5.8 & 7.6 kms a.s.l. The trough of low at mean sea level over south Andaman Sea and adjoining southeast Bay of Bengal now lies over southwest Bay of Bengal. Chennai gets 100 mm rainfall in less than hour. Entire Theni and Madurai district got battered. Tiruppur getting second day of 100 mm's. Isnt the current spell better than NEM. Exactly correct - SE India always in mercy of ever failing NEM since 2010 resulting in successive droughts - in this context April rains are nothing less than sweet nectar directly from heaven..
rajesh sir, will it rain in north konkan means panvel,mumbai,pen,roha in the period between 26th april to 1st may.if yes,then please post a quick view of you about it.please let me know.and thanks in advances.waiting eagerly for your reply.